The US is experiencing its most protracted economic slump since the Great Depression. While economists like Paul Krugman advocate stimulus and government action, Republicans are insisting on expenditure cuts and no taxes. Can you see a resolution to this impasse? This is going to be the central debate in the election. It’s a debate that both Romney and Obama say will determine the sort of society America will be and will become. A contest of ideas. Yes those on the left, like Krugman, see it as a choice between a careful government guiding hand investing in things like infrastructure, healthcare and education versus what Barack Obama derides as the ‘thinly veiled social Darwinism’ of the Republican alternative budget plan. On the right, it’s seen mostly as a simple contest between the evils of European style socialism and freedom. They both need to win over the middle and, so far at least, neither one of the arguments has emerged as the one that’s winning the vote. The economy is a big problem for Obama and many feel he hasn’t done enough yet to fix it but many people do still acknowledge that he inherited a tough economic mess. For all that people are worried about the debt. They’re worried that America is losing its ability to make things, they worry about the state of education, about impossible student loans and any number of things. But they look at the mess in Congress and remain unimpressed with all the short term political posturing and the inability to reach a compromise on anything that might help solve some very real problems in the longer term. Both sides talk about the need to cut public spending – but they both fight hard to retain spending in areas they believe are essential and of course the Republicans refuse to acknowledge the need to raise taxes of any sort, so in the short term at least the impasse will continue. There are big financial and economic problems coming for whoever wins the election. If it’s Obama, he will still find it difficult, if not impossible, to get anything done with a Republican majority in congress. If it’s Romney, he’ll find it difficult to meet the demands of the Tea Party caucus in Congress and will be hamstrung by his promise not to raise any taxes of any kind. So the short answer is I don’t see a resolution to the impasse in the short term – no. The election of Barack Obama was a massive symbolic breakthrough for America. Having elected a black President, do you think Americans are ready for a Mitt Romney – a Mormon – to occupy the White House? A lot of Mormons would argue that the country has moved well beyond its suspicion of their religion but the fact is that many on the right – particularly the evangelical Christians that are so important to the republican vote, do still view Mormonism as a cult and as a heresy. Some have said so openly. This is one of the reasons why the conservatives have had such a hard time accepting the Romney candidacy, but now that he is the Republican nominee many will simply fall into line and vote for him because their desire to defeat Barack Obama is greater than their fear and suspicion of Mormonism. In the book I spend quite a bit of time on this question and not all Mormons – and certainly none of those who call themselves ‘fundamentalist Mormons’ – really believe America is ready to accept a Mormon president. Mind you many said the same thing about Catholics before JFK was elected. But the interesting thing about this political season is that we had not just one but two Mormons – Romney and Jon Huntsman – running to be the Republican nominee. That does suggest that the general public doesn’t care that much any more. And America has certainly moved on a bit from the 1840s when Joseph Smith, the founder of the Mormon faith, also ran for president. Unfortunately for him, his campaign came to an end when he was assassinated. His flock then began their long trek across the country fleeing persecution. They eventually found a home in Utah but they haven’t yet made it to the White House. If Romney wins and his presidency is judged to be uncontroversial then no one will think any more about it. I enjoyed your writing about the arts-based renewal of Detroit. Do you think the US can rebuild its manufacturing base, or will these rust belt cities continue to be gentrified as low rents and vast industrial spaces become more and more attractive to creative types? No I think manufacturing – in the old steel heavy industry sense – is all but dead in the United States. There will still be small pockets that prove the exception to that, but basically manufacturing has been in steady decline here since the early 1980s and like many other countries the US has lost out to cheap labour and cheap materials in the developing world. Over time a lot of the old rust belt cities will be either pulled down or gentrified. Part of the problem is it’s actually very expensive to demolish these places so that’s why so much of it is still here – there are industrial ghost towns all over the north east and there’s just far too much of it. There aren’t enough artists to fill them that’s for sure but in places like inner city Detroit and inner city Cleveland in Ohio there are artistic enclaves blooming among the industrial decay. That is helping rejuvenate those cities and certainly bringing some parts of them back to life. But the problem is so huge and it’s an economic transition that is still evolving. Some places are also making use of the space for technology industries, medical research etc. but many of those who are left living in these areas are poor, black and unemployed with nowhere else to go and no way of fitting into the new economy. You write about the Latino demographic shift sweeping the US. However, despite their numbers, Latinos are under-represented in professional employment – do you foresee a significant expansion of a Latino middle class and, briefly, what are the ramifications? Inevitably yes. Latinos are the fastest growing demographic in the United States by far and they are the big change that is sweeping the country. There will be many middle class Latinos in the future and they will inevitably move into powerful professional and political positions. Certainly the next political barrier to be broken here is ‘the first Latino president’. Latinos believe their time is coming and that they are changing America. It won’t be too long before they are a majority in the country – perhaps as soon as 2050, definitely by 2080. They are already a majority in California and there you can see just how the Latino culture is changing America. Not long ago Latinos lived mostly in the barrios of East LA and commuted to the rich white belt in West LA to work. Now Latinos are everywhere in LA. They are a majority in all the public schools. They are a majority in formerly black neighbourhoods like Watts and South Central. But they have yet to become the dominant culture and they are under-represented in politics, in professions and in popular culture. But that’s changing fast. An overwhelming majority of Latinos vote Democratic so the political ramifications are obvious. They are already changing the political colour of some states in the south and certainly they are presenting a difficult problem in the long term for the Republican party. Despite massive structural debt, the $US remains the world’s safe haven, and America is still an engine room of creativity. Where do you think the world’s biggest economy is heading? For all its faults this country still has an incredible ability to reinvent itself. However fast the developing economies are growing they still have a long way to go to catch up the United States. This is still going to be the biggest economy in the world for some time yet – certainly for my lifetime – and it’s still the place where people with ideas come to realise them. Just look at the high tech sector for instance. Almost all of the big companies that are making the global future are in America. Google, Facebook, Apple, etc…. and Silicon Valley is still the place that takes the big risks on big ideas. The economy here is in transition – it has been since the 1980s – and it’s unclear where that transition is going or where it’s going to end. The problem here is the ever increasing wealth gap. Not only is manufacturing disappearing but so are many of the jobs that have supported a middle class. The middle class is shrinking and the country is changing. The certainties of post-war America – that most people in middle America would be able to afford a house, a family and an education … that their children’s lives would be better than their lives – that’s been eroded. This is the first generation of Americans that have not been able to say the future for their children will be better. I think that shift has been profound and will continue to a force driving change. The franchising of America, the outsourcing of jobs, the health care issues – these are all big social and economic problems to overcome. The American economy will continue to grow in different ways but the big challenge here it seems to me is social and societal as well as economic. 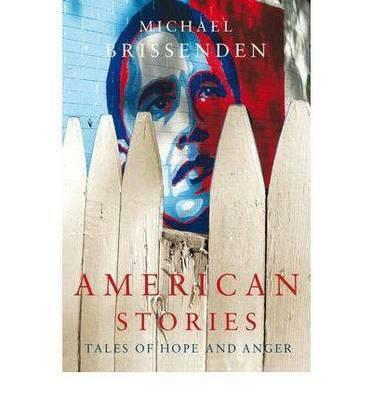 American Stories: Tales of Hope and Anger is out now.